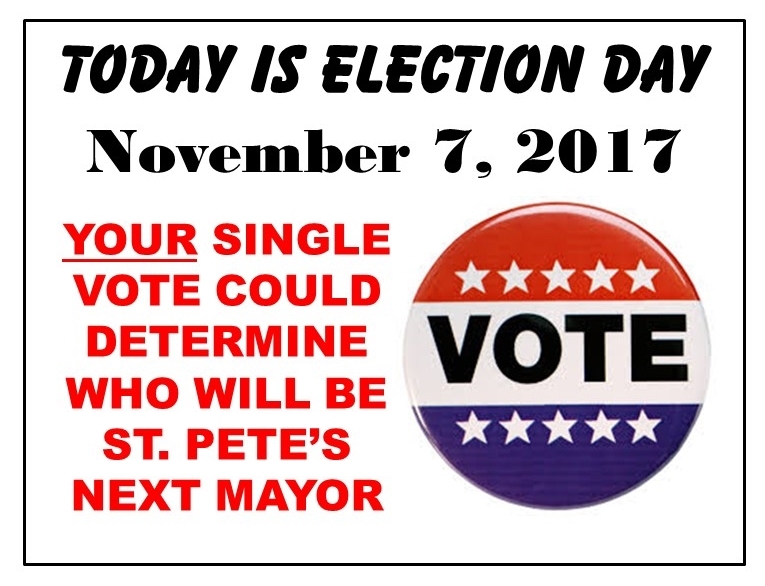 Your vote could actually be the one that picks St. Pete’s next Mayor. There were 265,191 Ballots mailed in Pinellas County 119,883 have been returned (45.21%) and 1823 people have taken advantage of early voting. Experience tells us primary voting is a good indicator of general election voting and with each mayoral candidate getting about 48% of the votes, Kriseman won by just 69 votes, so that leaves about 4% of the vote to decide the outcome. I have been focused on the St. Petersburg Mayoral race because I think St. Pete is at a major crossroad, and the Kriseman administration’s approach is seriously lacking. Having worked with both candidates during my 28 years with the City of St. Petersburg Rick Baker is the best choice. You get honesty, integrity and a local focus. Scroll on down this Blog site and you will get a host of information. I have, however, received a number of questions about the St. Pete City Council races, so here is my over view of the District candidates. The candidates are Barclay Harless a banker and Brandi Gabbard a relator with deep ties to her profession. I have struggled with this one. I have always been reluctant to support candidates with a long career and connections to the real estate profession. The problem is with years of “real estate” experience, they tend to view everything through the eye of property values, buyers and sellers. If you read the Catlin Johnston review below you will note most of Gabbard’s answers reach back to property values and development. To work for St. Petersburg, Gabbard will need to leave her realtor’s hat in the City Council staging room and take a bigger view than property values. My reluctant nod on this one is Gabbard, but you may want to take a close look at Harless since I think he comes to the table with fewer preconceived biases. The candidates in District 4 are Jerick Johnston and Darden Rice. Darden Rice will win this race going away but there are a couple of things to consider. Darden is a consummate self-promoter, and her emphasis on grand-scale issues like transportation and campaign finance reform don’t always serve St. Pete well. She is also a professional politician. You can rest assured that within a month of being sworn-in Rice will have already selected her next political office and will start campaigning for it immediately. Rice’s political fundraising acumen has not escaped fellow Democrats, so she will get a lot of ongoing party support and the demands that come with it. Jerick is a young political neophyte, and he deserves some credit and a few votes for his willingness to step into a race where about all he can hope to accomplish is to get some experience. A loss to Darden Rice will not be a big political resume killer, and I think we can hopefully expect to see more from Mr. Johnston. You can get more details from Divya Kumar, Times Staff Writer; Know Your City Council Candidates: Jerick Johnston vs. Darden Rice District 4. My nod goes to Rice, but if you would like to send a message to our local Democrat Diva, you might just cast a vote for Johnston. If Johnston does a bit better than expected, it might just give Darden a pause for thought. The worst thing about this race is the District itself. Gerrymandered to the nth degree this District presents many major problems. In my view, none of the constituents in this District are going to get fair representation. No matter who wins this race, the people living south of Central Avenue have a serious bone to pick with the process. The Candidates are Justin Bean and Gina Driscoll. The real choice is between a cowboy and a mild-mannered neighborhood activist. In my 28 years with the City, we had a couple of cowboys and cowgirl or two on City Council. They are fun to watch and provide some often-needed comedy relief. They are seldom effective, frequently disruptive and on rare occasions contribute a gem of common sense or wisdom. On the other hand, the neighborhood associations and their leadership have contributed a number of highly effective City Council members who have been especially useful under the strong mayor form of governance. You can get some additional information from Waveney Ann Moore, Times Staff Writer; Know Your City Council Candidates: Justin Bean vs. Gina Driscoll, District 6. No messages to be sent here. My nod here goes to Driscoll, because if a) Kriseman wins there will need to be some strong voices on City Council to reign in what is destined to be a runaway political nightmare; and b) if Baker wins there will be a strong effort to rebuild neighborhood association leadership, and they will need a strong advocate on City Council alongside Amy Foster, Lisa Wheeler-Brown. It is extremely important that you vote in these races. They are all voted on citywide. This Mayor’s race could easily be decided by a hand full of votes. Don’t wake up Wednesday morning only to find your mayoral candidate got defeated by a couple of votes and you might have made the difference.